Spider-Man Deluxe Dual Action Web Blaster by Toy Biz. Now kids can shoot webs just like Spider-man with the Spider-Man Web Blaster. 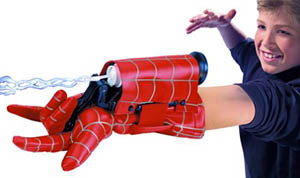 Just put on the Spidey glove, insert a can of web fluid, pull down the lever and shoot webs like the web-slinger himself. The Web Blaster also comes with a Spiderized attachment that lets children shoot water instead of webs, making this two toys in one. Includes 2 cans of web-fluid / shoots over 600 feel to webbing / Non-flammable / safe non-toxic web fluid.